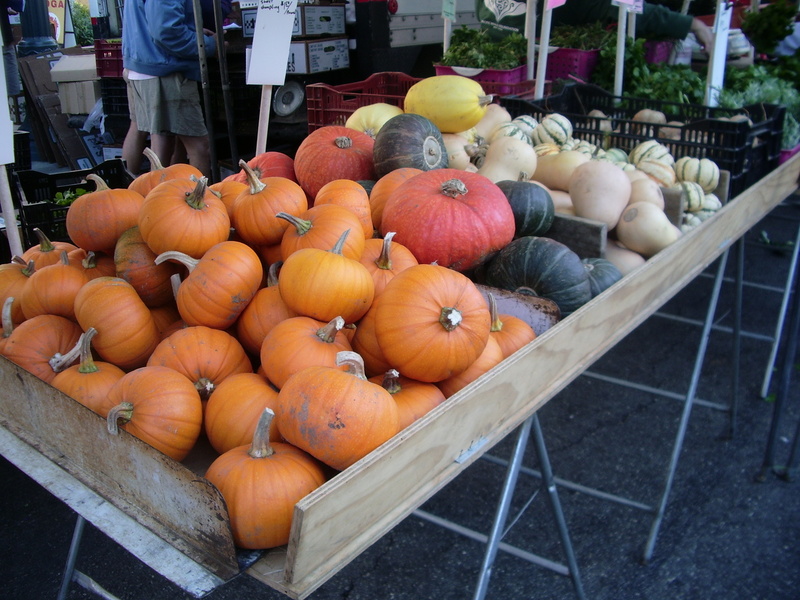 Squash exist in a seemingly endless variety of shapes, sizes and colours. Ranging from the diminutive patty pan to the giant pumpkin, intermediates include the bell-shaped butternut, as well as the appropriately named acorn and turban squash. They can be gold, orange or yellow, glowing even before they’ve been carved and illuminated. Others are blue or green. By the autumn and winter they generally have hard skins, contain large seeds, and can be used in either sweet or savoury recipes. Traditional dishes include soups, stews and pies. Used either at the heart of a meal or as an accompaniment, they can be stuffed, mashed or roast. And while this scope can seem overwhelming at first, it also makes squash an invaluable addition to anyone’s culinary repertoire. I’ve been on a steep learning curve, and now know that most autumn / winter squash are delightfully sweet. Roasting is a process which works to intensify this, helping to develop depth as the squash caramelizes in its own juices. 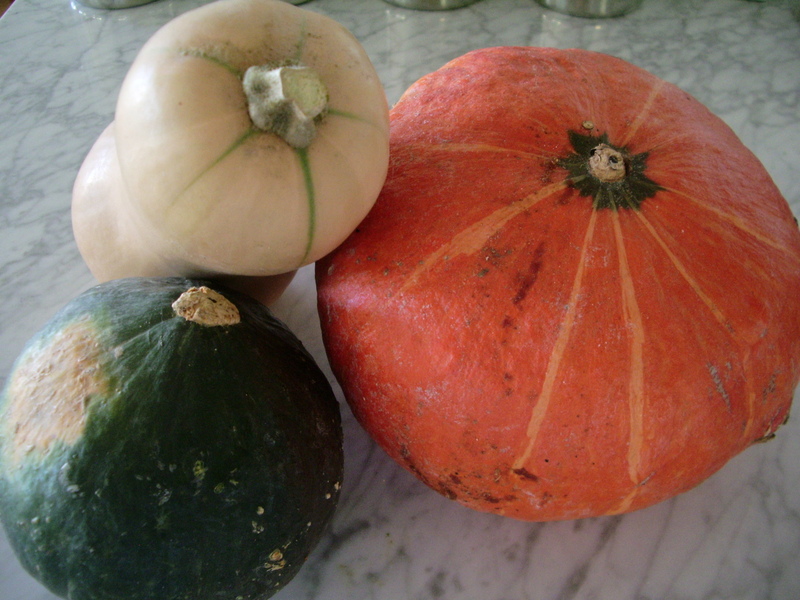 It also seems that squash benefit from being cooked with bold, strong flavours. Suggestions include the sharpness of ginger or lemongrass, the heat of chilli, the salt of bacon or chorizo, and the zest of citrus, as well as sweeter pairings with spices such as cinnamon, nutmeg and cloves. As far as herbs are concerned, rosemary seems like a popular choice. Working with this I decided on the recipe that follows, and served my softly melting and caramelized squash with chicken thighs, themselves roasted with garlic and olive oil, along with wilted kale. I bought my squash – a mixture of ambercup, butternut and buttercup (I think!) – from the twice-weekly Santa Monica (Downtown) Farmers Market, a place that deserves to be the subject of its own dedicated post at some future date. Wash the squash and wipe dry. Cut into quarters and scoop out the seeds using a spoon. Leave the skins on for roasting as this helps to keep the soft flesh from collapsing, but remove for eating. Slice into wedges and put into a roasting tray. Add the chorizo, garlic, rosemary and chilli. Add pepper to season. Drizzle olive oil over the top and mix together well. 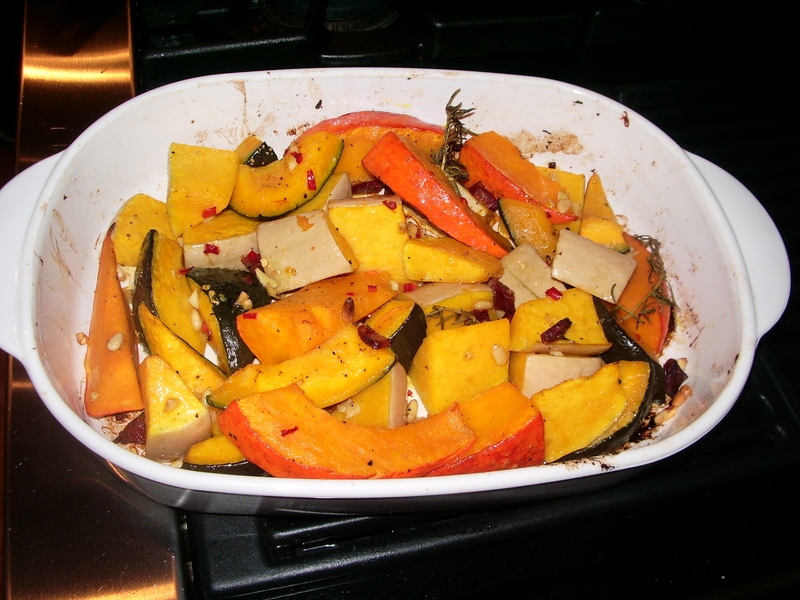 Roast in a preheated oven at 375°F / 190°C / Gas mark 5 for approximately 50 minutes (until the squash is soft), stirring and mixing halfway through. Like much fresh produce, squash is good for you! It’s high in fibre, and many varieties (including butternut squash and pumpkin) are rich sources of both the mineral potassium and vitamin A. (Potassium is important for maintaining fluid and electrolyte balance, while vitamin A has a variety of metabolic functions. Present as provitamin A carotenoids, this also suggests an antioxidant role although the implications of this for humans is still somewhat uncertain). Note: Excessive levels of vitamin A can be toxic to humans. It is generally considered that dietary sources are a healthier way to obtain sufficient and appropriate amounts than from the long-term use of supplements. However, if you have a medical need to take vitamin A in this way then you must consult your doctor or physician before making any changes. This entry was posted in Nutrition, Recipes, Seasonal, Vegetables. Bookmark the permalink.